We see in this painting only Jesus and Lazarus. In the biblical account in John 11 a crowd is standing around this pair: the disciples, Mary, Martha and the people who came with them to mourn. But here the setting has been reduced to its essence: Jesus, the open grave, and Lazarus. With this stark set-up, the English artist Roger Wagner (b. 1957) reaches back to the images of the Resurrection of Lazarus in Early Christian art. From the 2nd century onwards this theme was portrayed, an obvious subject for catacombs and sarcophagi. In the 4th century the other people present at the grave also received a place in the murals and icons, but before that time the focus was on the crux of the event: Lazarus standing in front of Jesus like the pupa of a butterfly, waiting for deliverance from his cocoon. In the painting Jesus and Lazarus stand facing each other. 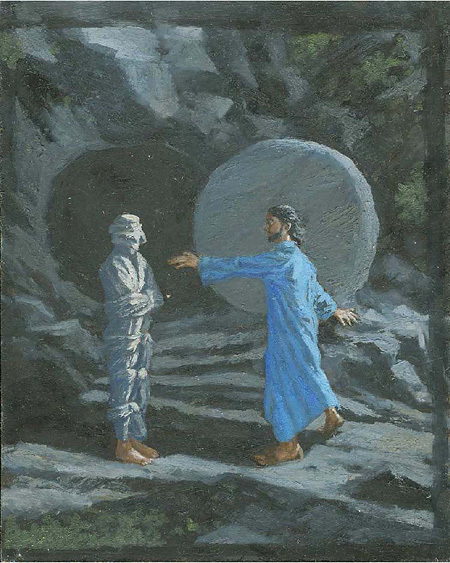 Lazarus is stock-still, while Jesus is filled with dynamic vitality as he stretches his hand out to Lazarus, on the brink of pulling him out of the dark circle of the grave. It reminds me of Aslan, when he brings the petrified figures in The Lion, the Witch and the Wardrobe back to life with his breath. Light is falling on Lazarus. Jesus’ garment is blue, the color of heaven. The circle as symbol for eternity – having beginning nor end, going on for ever – plays an important role in this artwork. Behind the two figures are two circles. Behind Lazarus is a darker circle and behind Jesus a lighter one. Eternal death and eternal life are put over against each other. The darker circle might refer to what is said about the godless in Psalm 49: ‘Their graves are their homes forever.’ The grave stone that has been rolled away, the lighter circle, is a symbol for eternal life here. In the words of Psalm 49: ‘But God will ransom my soul from the power of Sheol.’ At the same time the round stone behind Jesus’ head acts as a halo, as an indication of his holiness. The rolled-away grave stone also reminds me of a millstone, which functions in older art as a symbol for eternity, as a millstone is so heavy and solid that it can’t possibly be destroyed. It refers to the permanence of the things that will last eternally, contrasting with the vanity of all that will pass away. In first instance this painting is about Lazarus, but in second instance it is also about us. It offers us a beautiful image of how God is at work with us. While we are the living dead, wrapped up by all that limits and confines us, God calls to us: ‘Come out!’ He wants to free us from our daily grind, from the sins and addictions that bind us, from the fears that stifle us. He wants to call our deadlocked relationships, our frozen feelings and buried talents to life again. All we have to do is dare to step away from our dead places and come when he calls us to step out, then he will give us new life and unwind us from our shrouds, as a glimpse of the future. John 11 is also significant, because this chapter gives us a look in the heart of Jesus. He is weeping (John 11:35). He is deeply moved when he sees what heartbreaking sorrow death creates in family and friends. And he is angry. The Greek word used literally means: he snorts like a horse. Here we see Jesus in his full humanity. Is this why Roger Wagner depicted him with such large feet, as a human being who is tightly connected to the earth with his feet? Born in 1957, Roger Wagner read English at Oxford University before studying under Peter Greenham at the Royal Academy School of Art. He has been represented in London since 1985 by Anthony Mould Ltd, exhibiting there in 1985,1988, 1995, 1999, 2000 and 2004. Other one man shows include a retrospective at the Ashmolean Museum in 1994, a touring exhibition of illustrations of the Book of Job in six cathedrals from 1995 to 1998 and a retrospective at The Prince’s Foundation in 2001. He has produced several books of illustrated psalms, poems and translations. Forms of Transcendence: the Art of Roger Wagner by Chris Miller with foreword by Richard Harries has been published by Piquant. He has work in the Fitzwilliam Museum Cambridge, and in many private collections in England, Ireland, Switzerland, Australia and America. His large major work Menorah has been bought by the Ashmolean Museum in Oxford. Roger Wagner: The Book of Praises: a Translation of the Psalms , Book 1: Psalms 1-41, Book 2: Psalms 42-72 . Chris Miller: Forms of Transcendence, The Art of Roger Wagner, Piquant – Carlisle, 2009.